Hair extensions are available in a variety of materials. A stylist putting in hair extensions. People who have long hair have a variety of hair extension options available to them. Long hair extensions can be clipped, glued, sewn or fused to a person’s natural hair. These extensions are available in a wide range of qualities, from synthetic to high-quality human hair. To choose the best hair extensions for long hair, base your decision on quality, affordability and the level of commitment required. One advantage of long hairstyles is that any type of extension can be used to add length or volume. The most popular types include protein bonds, micro links, sewn-in wefts, glued-in wefts and temporary clip-ins. Each type has its own advantages and disadvantages. If you are looking for long-lasting hair extensions, consider bonded extensions. 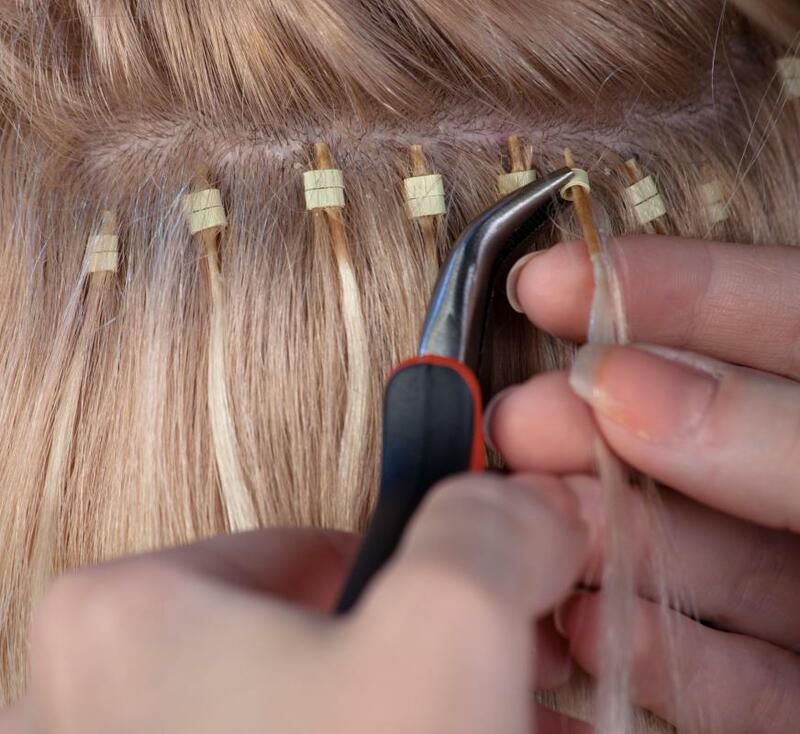 Protein bonding is a technique in which individual extensions are bonded to the base of the hair using a specialized tool. The bonds are placed close to the scalp, so they will be completely hidden by your long hair. These extensions can last from a few months to a year, depending on how well they are maintained. Bonded extensions are some of the best hair extensions for long hair, but they also are the most expensive. Prices vary according to the quality of the hair and density of the extensions. Other techniques are significantly more affordable. Micro links are another popular option of hair extensions for long hair. These extensions are less damaging because they are not bonded or glued to the hair. Instead, individual extensions are held in place with small metal links. When carefully maintained, these extensions should last for several months. Long-haired individuals who are worried about damaging their hair but want lasting extensions should consider micro links. Hair wefts, which are long strips of hair, can be glued or sewn into a person’s natural hair. These extensions usually are fastened to small braids that are woven to the scalp. If you are getting hair extensions for a special occasion, these might be a good option. Sewn-in extensions can last more than a month, but glued-in extensions will last for only a couple of weeks. The most versatile type of hair extensions are clip-in extensions. 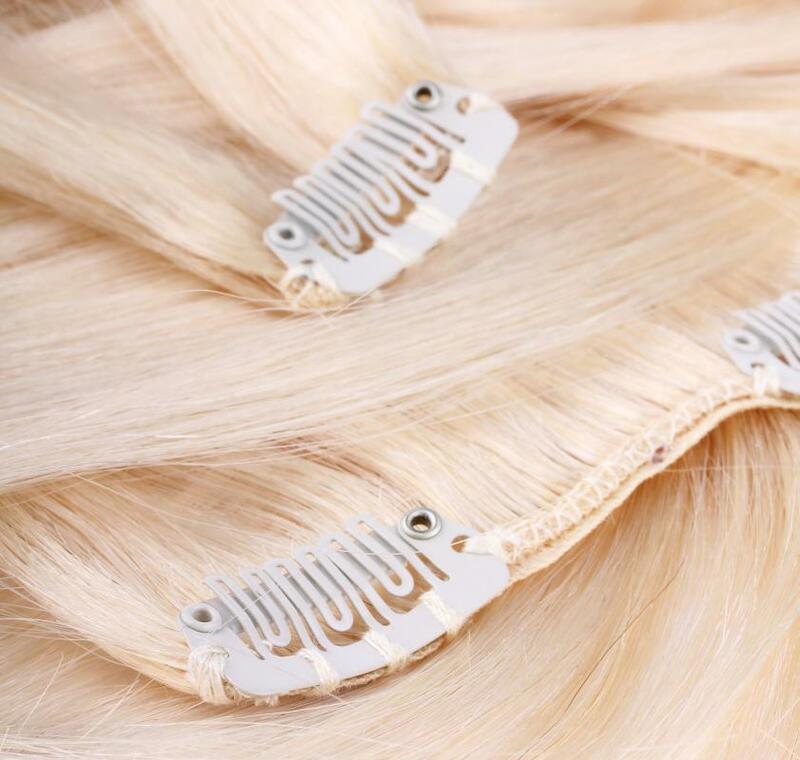 Clip-in extensions are made from wefts of hair that are fastened to small clips. These extensions are clipped to the underlying layers, which allows them to go completely unnoticed. Clip-ins are low-maintenance extensions that can last from a few months to a few years, depending on the frequency of use. After you have chosen an extension type, you also must choose hair. When getting professional hair extensions, hair might be provided by the stylist. To lower the cost of the extensions, you may be able to purchase your own hair. If you are applying dot-it-yourself (DIY) hair extensions, you will need to purchase hair from a beauty supply store or other specialty retailer. Hair extensions are generally made from Asian, European, Indian and virgin hair. Virgin hair, which is also known as Remy, typically is blond hair that has never been subjected to chemical processing. This is the highest quality but is the most expensive type of hair used for extensions. European hair is next in quality, followed by Asian hair. Indian hair is commonly used in making extensions for women with kinkier hair. Unless you are purchasing clip-in extensions, synthetic hair is rarely a good choice. Most long-haired individuals use heat during styling, so synthetic hair will quickly become damaged. If you are looking for affordable extensions, high-quality Asian, European, or Indian hair is a fine choice. To choose hair extensions for long hair, carefully consider your level of commitment toward maintaining the extensions. Most hair extensions will need to be applied and removed by a professional. Bonded extensions will also require regular maintenance because some of the bonds might prematurely loosen. To ensure that you choose the best extensions, base your decision on the amount of time, effort and money you are willing to invest in your hair.